After a great rest in a very comfy hotel rural we felt ready for today’s climb. Concerned over yesterday’s episode, Rod felt Delana should not carry a pack today. Delana insisted she was fine and could certainly carry her own pack…reluctantly she finally let Rod put her pack in his. We started out earlier than usual and it was a perfect morning, which somewhat allayed our anxiety about our upcoming walk. Other pilgrims ahead of us had warned of the trail ‘s difficulty. The first hour was almost sensory overload. The Leon Mts.were incredibly beautiful garbed in golden broom, emerald pine, and burgundy Spanish heather. Clouds and sunlight played dapple on the mountain sides creating subtle shading alternating with bursts of colour. The crisp, cool air was perfumed with the fragrance of broom. Little birds known as “verdecillas” (little green birds) hopped from bush to bush, warbling joyfully. It was lovely. 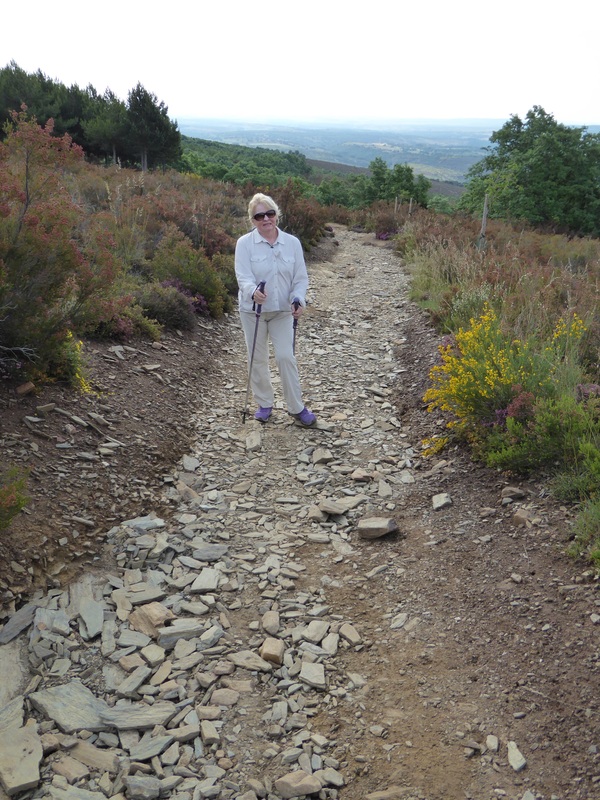 The ascent was moderate even though we were climbing to the highest point on the Camino. Part way up one of the hills we caught up to a French fellow, about our age, pulling a travois contraption he had fashioned out of parts of a wheel barrow, some aluminum piping and straps. 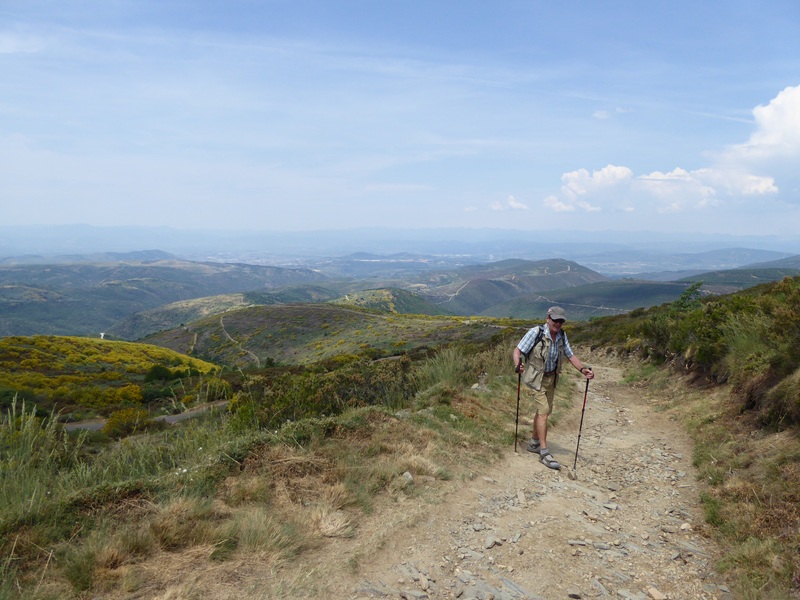 He had trekked almost 2/3 of the Camino when he injured a knee and could no longer carry his pack. Determination to complete his walk resulted in this man building something on which he could push or pull his belongings. Encountering him was another inspiration along our Camino way. 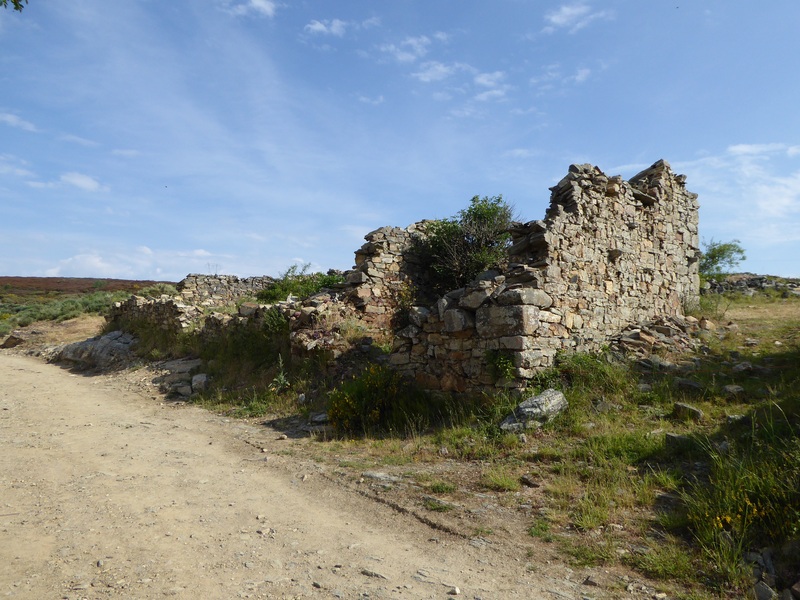 So many of the villages along the climb have literally fallen to ruin over the centuries. They were mostly stone and mud, but with slate roofs not the terra cotta tiles throughout the rest of the Camino. This is a remote alpine farming area, isolated in the winter months. The passage of pilgrims has given new life to these villages and small seasonal accommodation and restaurants have begun to appear. We reached the Cruz de Ferro (1490m or 4,888 ft) with little problem as our ascent from our village was only 450m or 1500ft. 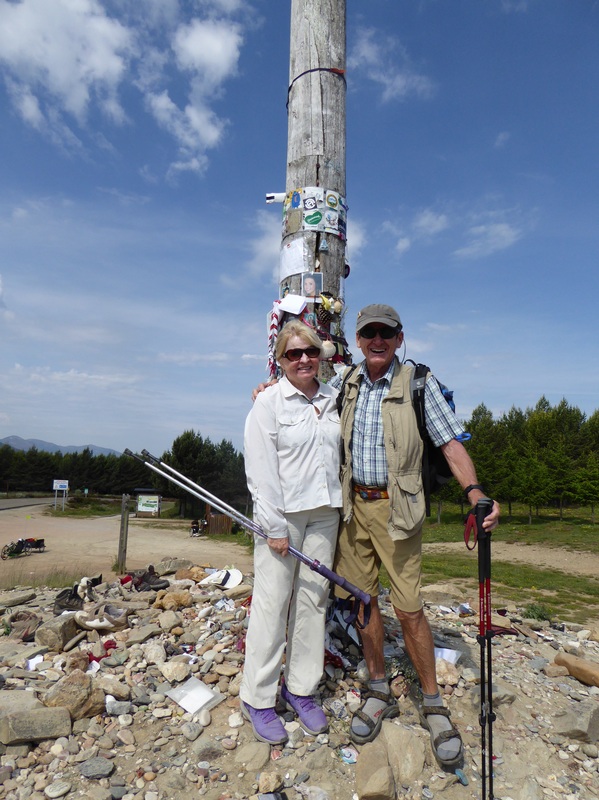 Cruz de Ferro is an iron cross atop a 5 metre wooden pole and is one of the most emblematic monuments on the Camino. Pilgrims bring a stone from home and place it at the base with the many thousands already there. Leaving a stone is a way of leaving behind a burden, letting go of something in your life, or simply a symbolic gesture of reverence. It is an emotional few minutes despite the fact that pilgrims have begun leaving all sorts of items not only rocks, resulting in a bit of a trash pile. We left our wishing stones found on the beach at Forever House. At Cruz de Ferro there was a young man who is a paraplegic pilgrim. He is doing his Camino riding a special tricycle with a place on the back for his wheelchair. This courageous human being was truly another Camino inspiration. Soon after beginning the descent (925 m or 3,035 ft) we called upon these examples of courage and determination. The way down was tortuous. It was like a goat trail of loose, large rocks with huge outcroppings of slippery, broken shale. Every foot step had to be placed extremely carefully so it was slow going as the day heated up. 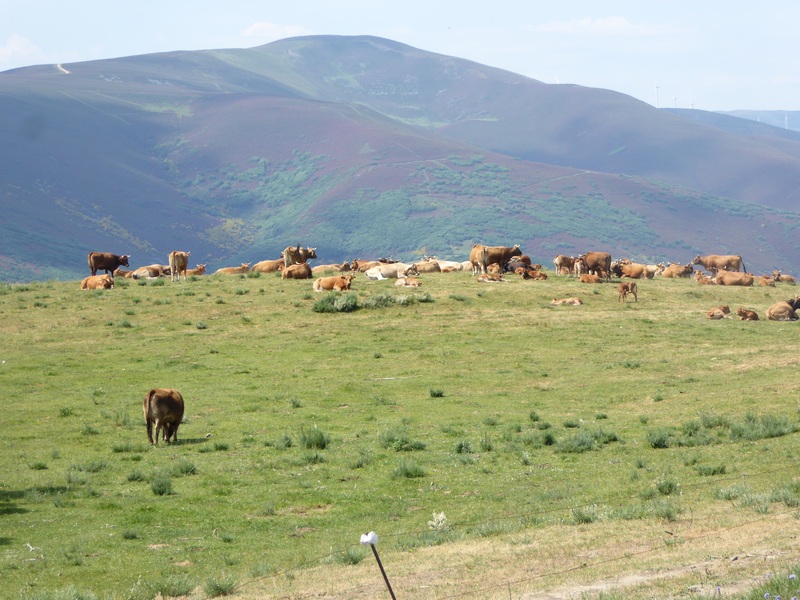 We looked at one another in askance wondering just what we were doing here—but there was no turning back.This part of the Camino is fraught with disaster. That afternoon a young Australian pilgrim fell and was taken off the mountain to the hospital. Somehow, we both made it to Molinaseca in one piece and we gave thanks. Near the top: we will descend to the bottom of those valleys before we get to take our boots off! In fact Rod made a huge mistake: travelling with three kinds of foot wear, he wore his Tevas and was not carrying any back ups in his back pack. Not the right footwear—not a good thing. It all started out as a beautiful day …. A walk in the park! Until the recent resurgence of interest in the Camino ( last year over 225,000 registered to do some portion of it) this area was in economic ruin. These stone walls are all that is left of centuries old buildings. 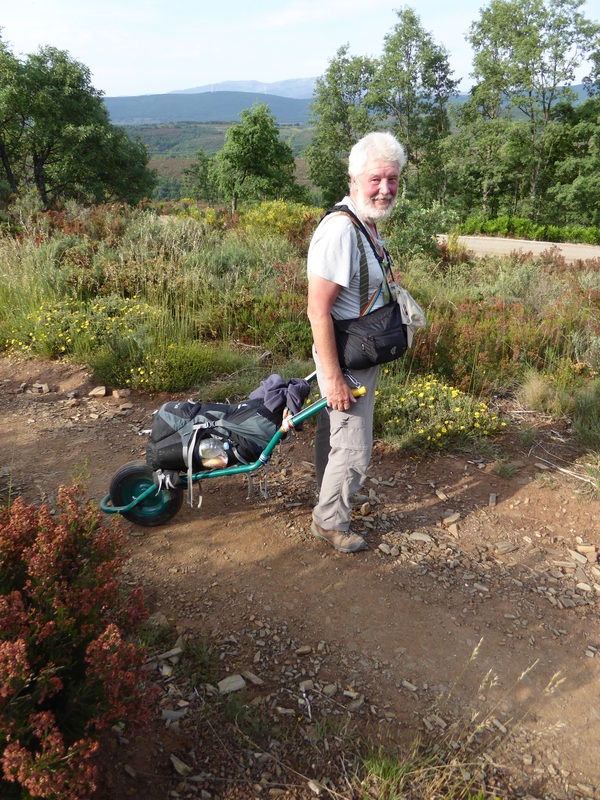 A Camino inspiration, home made cart ( a travois ) a bandaged knee and a whole lot of determination. Get the idea….. Not fun but once done, you feel a sense of real accomplishment. 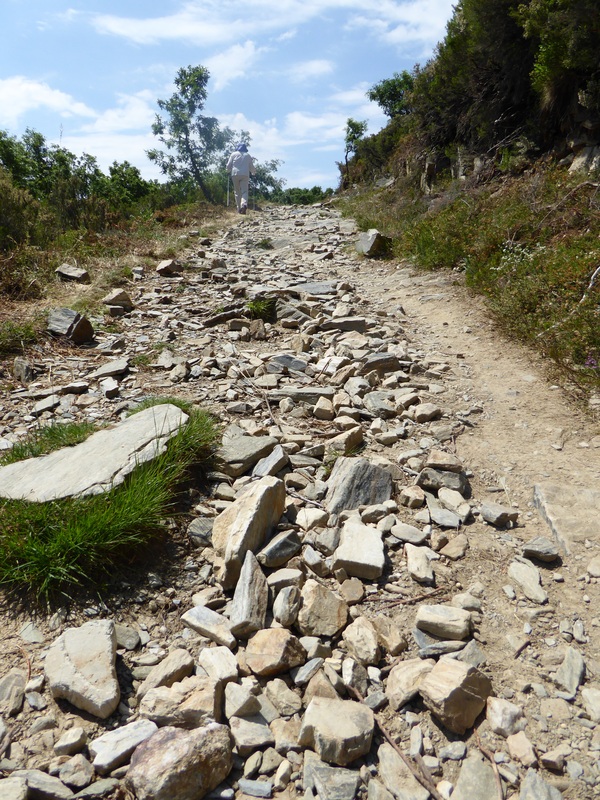 Had to show this: this is part of the 12 km steep descent – those rocks are up to 24 inches across, are loose and on grades up to 30 degrees. Rather than our 5 km / hour good rate, this slowed to as little as 1.5 km in an hour. This day challenged tracking up and over the Pyrenees as our most difficult day on the Camino. The scene near the top of the Leon Mountains. Bet those cows don’t climb it every day. What a beautiful sight…. That burgundy colour is Spanish Heather on the distant hills.